A Saco family has ridden the growth of its amusement park straight up. SACO – When Ken Cormier and his wife Violet opened Marvel Drive-In 51 years ago, he never dreamed of what that small fast-food joint would become. The couple’s entrepreneurship took them from serving up burgers, fries and lobster rolls to overseeing the largest combination water-and-amusement park in northern New England — Funtown/Splashtown USA. 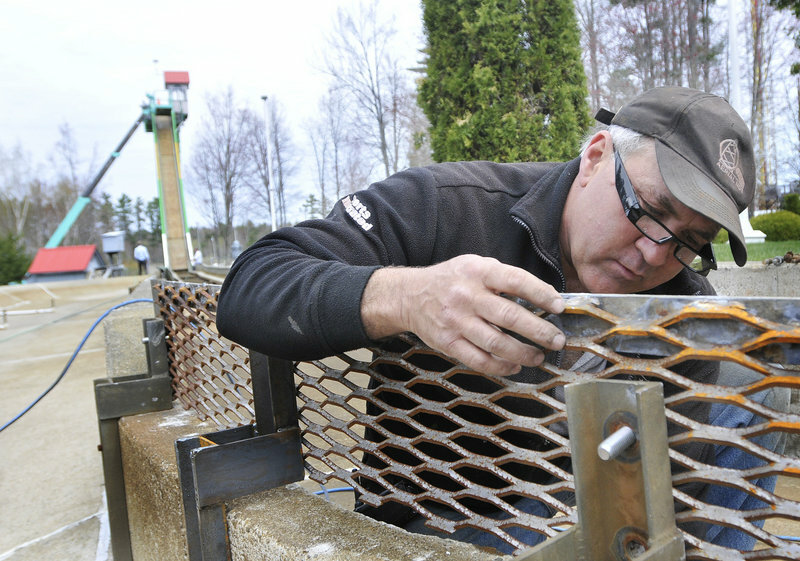 Billy Cormier replaces a bolt as part of the preventive maintenance for the Thunder Falls Log Flume at Funtown/ Splashtown USA. 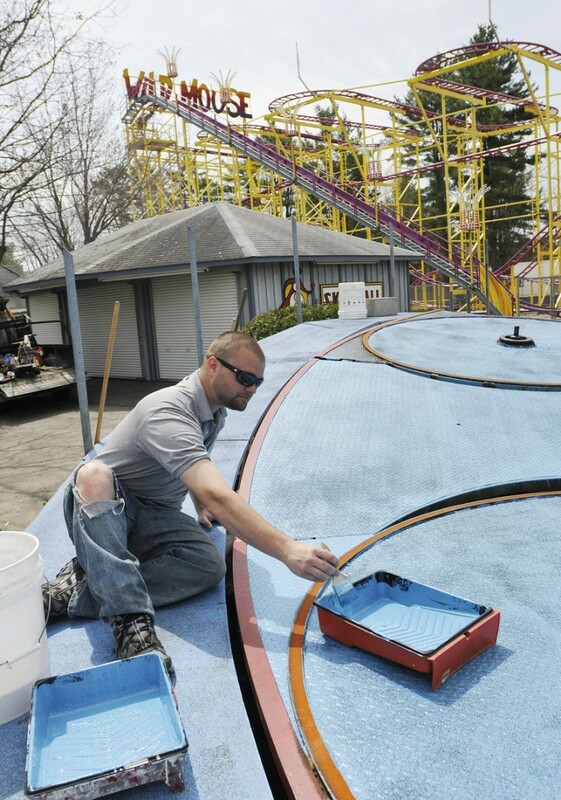 Chaz Cormier, one of many family members affiliated with Funtown/Splashtown, applies new paint to the Tilt-A-Whirl. Cory Cormier, top, and Shawn Lariviere inspect and maintain the wooder rollercoaster Excalibur asFuntown/Splashtown USA gets ready for the season. Despite that, Ken, 78, and Violet, 76, remain modest about the park they have developed. The thrill rides and water slides are there for kids of all ages to have a ball, just like the amusement park’s jingle says. “That’s my mission now, to try to bring some good times to children,” and see them smile, Violet said. The Cormiers established Marvel Drive-In in 1960 with a loan from Violet’s mother, long before McDonald’s or Burger King popped up in the city. They opened the restaurant on Route 1 next to a mini-golf course owned by Ken’s brother-in-law Andre Dallaire. As with any new business, Ken said it took time to build a consistent customer base. It wasn’t until 1964 that they felt well established and secure, he said. Around the same time, the Cormiers started thinking about adding amusements. The first addition was a batting cage. Ken said it was the first of its kind in the state, allowing hitters to slam baseballs out into an open field. Between the mini-golf, batting cage and restaurant, the site was becoming a destination. “(The batting cage) was a new amusement, and the seed was planted,” he said. The stretch of Route 1, now bustling with car dealerships and other businesses, was desolate at the time. Ken said it was considered a “dud” stretch of highway — to get to Old Orchard Beach, people coming from the south would take Old Orchard Road and people traveling from the north would take Cascade Road. Because of that, he said real estate was affordable making it ideal for business expansion. People started traveling the highway more when the Maine Mall opened in South Portland, bringing greater visibility to the area. More businesses popped up, making it known as the “auto mile” today. The Cormiers added about half a dozen amusements rides by 1967. The same year the privately owned company Funtown USA was born. During the next four decades, the park continued to grow. By 1996, the park was renamed Funtown/Splashtown USA to incorporate the water amusements. Of the 82 acres of land on Route 1 that Cormier Land Company owns and leases to Funtown/Splashtown USA, 45 acres are developed with amusements. The park now features 28 amusement park rides, 16 water slides and two swimming pools. 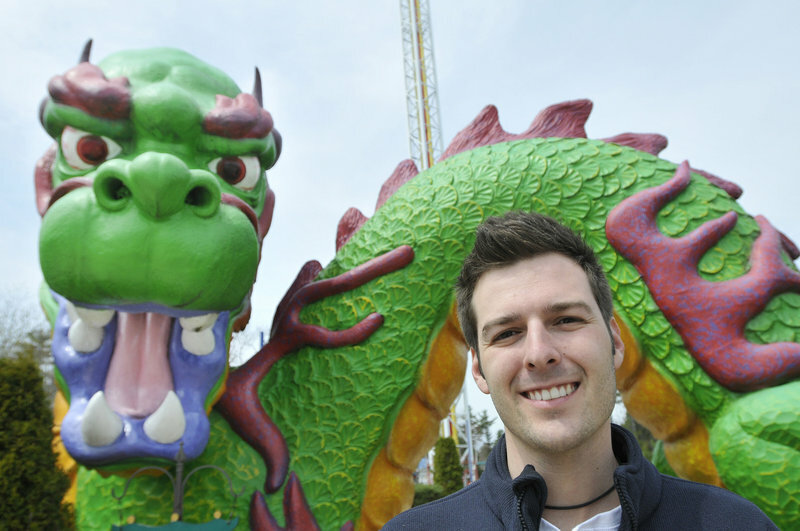 The tallest ride, the Dragon’s Descent, was added 10 years ago. Now consider Northern New England’s largest vertical thrill ride at 220 feet tall, it can be seen from miles away. Ken and Violet are at the park every day and remain involved in operations. In the conference room, Ken talks about a typical day working at the park for him. He faces a black and white photo of himself and Violet from when they opened Marvel Drive-In. It is framed by a collage of more current photos and hangs over an old-fashioned carousel horse. A decommissioned fortune teller’s machine sits across the room to his right. The mementos are reminders of how far the park has come over the years. Before the park opens at 10 a.m., Ken walks the grounds to ensure the rides and attractions are set for the day. Then he retreats to his office, where he analyzes the previous day’s sales and checks on all the departments. He is there when the park closes late in the evening too, prepping for the next day. Violet said she walks the park during businesses hours to check up on staff. She said it is important to her that the employees are completing tasks they have been assigned to do and providing excellent customer service. Funtown/Splashtown USA has 25 full- and part-time employees year round, bringing on a team of 600 for summer operations, marketing manager Edward Hodgdon said. Part of that year-round staff includes Ken and Violet’s children, two of their children’s spouses and two grandchildren. Violet said running the park is like a wagon wheel. Each department is like a spoke on a wheel. In order for that wheel to function properly, each spoke needs to bear the weight of the wagon. In other words, each department needs to complete their tasks — whether that’s sweeping the park or ensuring safe rides — for customers to receive the best experience possible. Each employee is trained extensively when hired to provide excellent service to park attendees. Violet said some of their first training manuals were modeled on Walt Disney World’s. Today, the company has its own manual revised annually. “This is a nice fun place to work, but it’s not just a summer job,” Violet said. She asks all employees to take their job seriously and always keep in mind that safety comes first. Regardless of the quality of service, the success of the business is in Mother Nature’s hands. The warm, sunny summer Maine experienced last year was excellent for business, Ken said. Likewise, rain and cold temperatures made the summer of 2009 a tough season. Weather is even more a threat to the industry than the economy. Even as some families tightened their wallets in recent years, trade associations say the industry is thriving. “Even in tough economic times, people still go to visit theme parks,” said David Mandt, spokesman for the International Association of Amusement Parks and Attractions. “They may visit a park closer to home, but the family still needs that getaway,” he said. More than 300 million people visit amusement parks across the country annually, according to the association, which is the largest trade association for the attractions industry in the world. Statistics listed on the association’s web site show a steady increase in attendance and revenue for about 400 parks in the states. In 2007, parks had revenue of $12 billion — compared to $5.7 billion in 1990, when 253 million people made visits. Ken served on the board of directors from 2008 to 2010. He brought his perspective as an owner and operator of to the association. Mandt said Ken was a champion for other small, privately owned parks. The key to staying competitive in an industry focused on entertainment is keeping it fresh through experiences, Mandt said. He said many of the association’s 4,000 members evolve the guest experience by adding new attractions or events. Expanding consistently over the years, Funtown/Splashtown USA has kept on top of that competitive edge. Ken said he watches industry trends to stay informed. “We’re always looking for opportunities,” Ken said, regarding expansion and improvements to the business. In the meantime, he is just looking forward to another busy summer.